BlogrCart Mukabuku Elite blogger store template is now at version 2.0 - quicker, optimized, re-coded plug-ins, no code edits setup & minimized Blogger template installs. Makes it easy to run your online store in minutes! Today we officially launched BlogrCart Mukabuku Elite, the replacement Blogger shopping cart template for BlogrCart Mukabuku, released 2013-2014. Both free and pro versions for BlogrCart Mukabuku will be retired but the documentation & live demo will still be available on-line for users references. 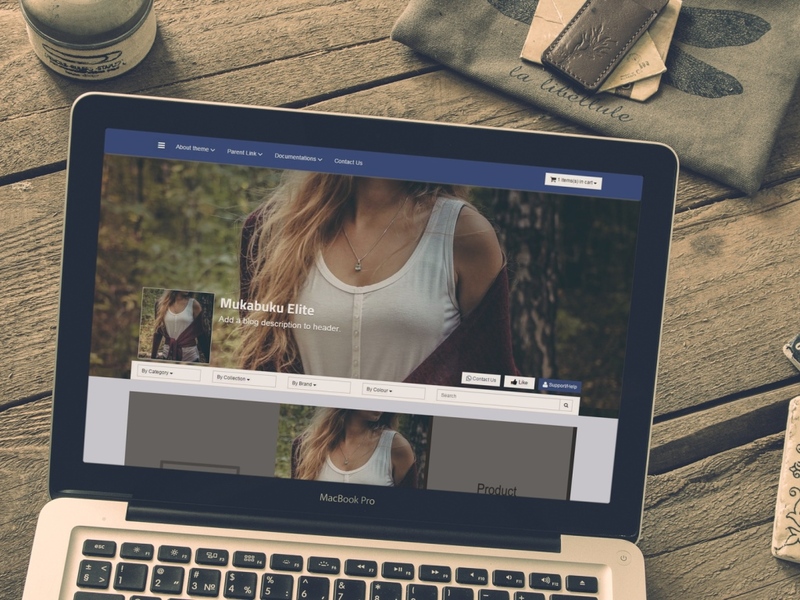 The initial theme design, idea & concept, which was focused on the ability to cross sell from your Facebook page to your web store is still strongly implemented. Hidden Like ( this is awesome ), optimized Share to page, Facebook overlay greeting ( with timer ), Fb comments & Facebook page display comes pre-installed with the new theme. We decided to replace the tiring Mukabuku theme, give it a new responsive web framework, included newer plug-ins & more e-commerce features, due to high demand by blogshop & web store owners. Most of Mukabuku older plug-ins is still used at Mukabuku Elite shopping cart theme, which includes the Discount Code add-on. We added more features which was lacking at the older versions & here are the sum up of the features introduced for the new template release. On previous Mukabuku Blogger template, users are required to edit the template codes to setup their store & customize how the theme displays. In Mukabuku Elite theme, we incorporated the custom Helper widget, which users only require to add in parameters to activate/de-activate or even customize the store setup, checkout options, how theme displays, without editing the template codes. All settings are available at their blogger dashboard. This is important as in mobile devices, Mukabuku Elite theme will really speed up displaying your store contents & be loved by today's search engines. Using Bootstrap3 responsive web framework really helps in displaying Mukabuku Elite template layout in any screen sizes including mobile devices. User do not require to include additional template for smaller screens as the framework does that marvelously. The unlimited shipping by weight options & select currency checkout changer is introduced which allows your users to select the preferred settings during checkout. This feature will automatically update the shopping cart totals once selected. Even if your store currency is not listed at Paypal, Mukabuku Elite can help your users (& you) to convert to a supported currency & checkout to Paypal. This conversion also calculates the shopping cart totals before checking out. The send order form input fields entered by user will be sent & automatically display at Paypal checkout page form inputs - to ease the checkout flow. Blogger store owners could customize & brand their checkout at Paypal by adding their self hosted logo & display at Paypal's checkout page. Add on plug-ins ( image slider & related products ) has been updated & now more efficient & reliable with fallback, when displaying data retrieved. More customization was introduced which you can access via the helper widgets. Display your Instagram images based on your custom hashtags. The plug-in is now pre-installed with theme & you can easily show off your promo images at Instagram at your web store. Obviously - Instagram is part of Facebook too. We added a product status section to allow display of a product status or availability. Blog owners can add in a product status just by including text at the specified location using the product helper blogger editor tool. By adding reserved keyword tags for example Sold Out or Out of Stock at the product status section, will automatically disabled the product Add to Cart button, anywhere where the product is displayed at your web store. All Blogger widgets/gadgets are compatible when used at Mukabuku Elite template. Users can still drag & drop ( the widgets ) to the desired layout location where it can be applied to. The theme is also compatible with Blogger Template Designer, which you can customize your theme fonts, colors, background colors using the dashboard provided by Blogger - pick & choose! Using Font Awesome really speeds up most of Mukabuku detailing features, especially the use of arrows, social icons, button icons etc. Users can display available icons using Font Awesome mark-up easily as Mukabuku Elite comes pre-installed with the plug-in. A separate cheat sheet is introduced & made available in template download files. This cheat sheet helps you to view all 120+ settings that can be included with BlogrCart Mukabuku Elite theme - really speed up theme install. We hope that with this new theme release, Blogrcart Mukabuku Elite will be as promising as it's successor. The good news, BlogrCart Mukabuku Pro version users will get this replacement theme for free - build more web stores! Special thanks to all of you for supporting our work.